So today is Thanksgiving. Whether you're tearing into a roasted turkey, a vegan grain cutlet, or even just a plate full of stuffing with gravy, you're probably consuming a lot of delicious herbs and spices in whatever it is you're eating. There's no better beer to pair with your holiday festivities than one of the beers from the magnificent Saison du Buff series. 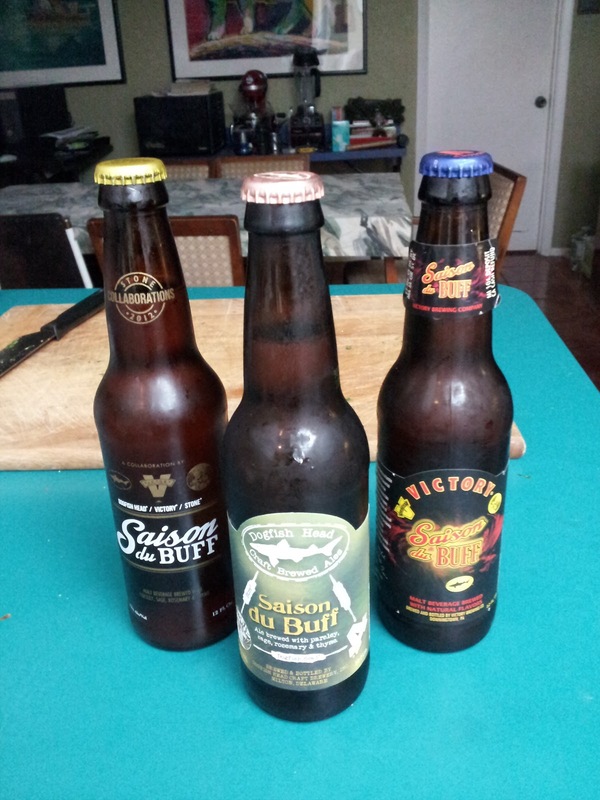 These three beers are all variations on the same recipe from Dogfish Head, Victory, and Stone Brewing Company. All three share a strong love and dedication for brewing excellent craft beers, and all three have achieved a moderate level of fame through their commitment to perfection, so it's a wonderful match for all three to collaborate on this peculiar beer. Each one includes rosemary, sage, parsley, and thyme, which makes it the best pairing you can imagine for your holiday meal, whatever it may contain. I'm sharing this with some close friends, and we're drinking each brewery's take on this fantastic beer. We're drinking them in order of release, beginning with Dogfish Head and ending with Stone. All pour relatively pale bodies with a thick foamy head, but each is slightly different from its peers. Since I can't write a paragraph on each beer due to similarities, I'll instead write a few sentences explaining how they contrast from each other. While the beer doesn't taste like a turkey dinner, it's the perfect complement. Dogfish's take on it is a crisp and hearty take on the beer, with the spices being heavy in the nose and relatively light in the body. More than any of the other flavors, sage takes the focus in this delicious incarnation of the Saison Du Buff. Victory's version of the Saison is a slightly fuller drink, a bit more of a punch in the nose and mouth. It still relies heavily on the sage, but the rosemary also plays gently at the back of my palate with each sip. The head is a little less heavy on the foam here than Dogfish Head's ample pour, but it's still a nice thick little endeavor. Tonight is the first time I'm drinking Stone's version, which is why I'm finally putting out this review that I've waited for months to write. The head is almost nonexistent, which is fine with me, and the nose is very citrusy in comparison to the other two. True to Stone's tradition of brewing strong beers, this one has a slight hint of piney hops added in to the herb-heavy mix, adding a bitterness that works quite nicely. 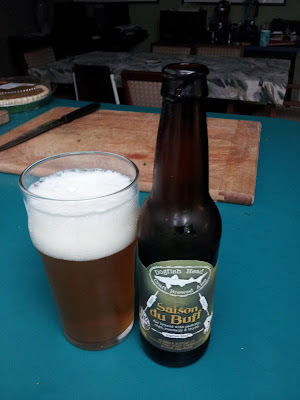 Whichever beer you choose to enjoy with your dinner tonight, be sure to check out the Saison du Buff family in the near future for some solid evidence that sometimes businesses can support each other rather than simply acting as competitors. I had a great time visiting with friends and drinking these three beers side by side, and I'm sure you'll have an equally enjoyable time whether you get just a single bottle or one from each brewery.